Tea pots have come a long way from the traditional tea sets that you may have come to know sitting in your mother’s china cabinet. Gone are the days of watching water boil, pouring it into a cup with a tea bag and timing how long to brew before you had the perfect cup of tea. The new generation of tea sets are so advanced that all you need to do is add water and drink. 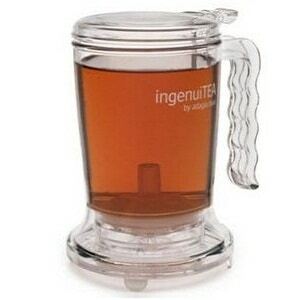 The Adagio Teas ingenuiTEA produces tea accessories that are one of the ‘must-haves’ for all tea lovers. It is highly recommend unique and practical tea pot. Adagio’s ingenuiTEA line of tea making products are the most innovative you will ever see. The design is simple, yet brilliant. You load the unit with your desired loose tea leaves or tea bag and fill with water. You then place the unit over your tea cup, open a valve on the bottom and gravity pulls the water through the tea and into your cup producing one of the best cups of tea you have ever tasted. When the water is drawn through the tea bag or loose leaves, a mesh filter prevents them from dropping into your cup. This not only allows only the tea-infused water to enter your cup, it also makes cleaning quick and easy. This tea pot is made in Taiwan from food-grade plastic and holds a maximum of sixteen-ounces of water, which allows for a substantial cup of tea. The unit is complete with an easy to grip handle. Feedback of the Adagio Teas ingenuiTEA Bottom Dispensing Pot rate it high on innovation, and as the name implied, ingenuity. Some users of this product have found that not only is it great to make tea, especially with loose leaves, it is an excellent coffee maker as well. Reviewers hint that freshly ground coffee beans can be placed in the container that is used to hold leaves or a tea bag in order to make a great cup of coffee, as the water is gravity fed over the coffee or tea and drips into the large cup below, ensuring no grounds or leaves enter the cup and taint your brew! The volume of tea this tea set produces may be a problem for those wishing to make just a single serving but that does not appear to be much of an issue. 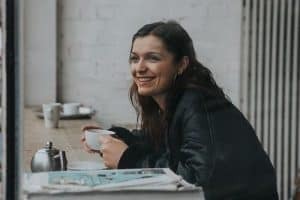 Another point that has been mentioned by online reviewers is the fact that the only way to stop this product from brewing is to allow it to completely drain, before you can start to enjoy your hot drink. In other words there is no ‘pause’ function; but the good news is that these remarks have been made as a suggestion to very improvements rather than it being a ‘negative’ or a complaint against the tea set as it stands. Adagio Teas has produced a number of amazing tea making products. One of their more innovative products is its line of tea sets that employ a bottom-dispensing design where functionality results from gravity pulling water through tea leaves, or a tea bag, and released into a cup. The design has made this a popular product as it is easy to use instead of using the traditional tea pot. The mesh filter located in the bottom of the unit for filtering makes clean up a breeze. Online reviews verify this and are reviewers have any issues with the product they are generally related to the volume of tea it brews (16-ounces at a time) along with the warning that once you start brewing you must wait until the process has finished before you can start to enjoy the tea. Aside from those concerns, the Adagio Teas ingenuiTEA produces tea accessories that are one of the ‘must-haves’ for all tea lovers. We highly recommend this unique and practical tea pot.